Noticed some unwanted guests in your neighbourhood? Lurking just a few inches beneath your Vancouver lawn there might be a menace squirming in your topsoil, chewing through your root system of your turf and grass. From New Westminster to Burnaby, Richmond and the western edge of Vancouver, you can see how the European Chafer Beetle is turning countless Vancouver lawns into diseased wastelands picked over by birds, raccoons, skunks and other urban wildlife. These 6-legged, tan or brown bugs aren’t that big, measuring just 1.5 cm long as adults – but in great numbers, they’re a tempting treat for animals who will dig up your lawn to get at the grubs in the winter. As you can probably guess from their name, these bugs aren’t originally from around here. But since they turned up in New Westminster in 2001, most likely in a contaminated batch of lawn soil, they’ve marched relentlessly into Vancouver, lawn by lawn (which wasn’t an unlucky coincidence – adults migrate to new lands by following the setting sun in the west). You’ve seen the signs: brown, unsightly patches on your lawn where once healthy grass grew; birds and small animals picking away at your property; maybe you’ve even lifted up part of your lawn and seen the Chafer Beetle grubs firsthand to see the horror beneath. Don’t panic. There is a solution to kill the beetles – and it’s natural, organic and chemical-free – just how most eco-friendly Vancouverites like it. Nematodes are tiny, microscopic worms that kill the grubs but are otherwise harmless to humans, pets and the rest of your lawn. You can purchase them from your local garden store, in packs of 50 million (yes, million – they are microscopic, so they fit in a package smaller than a Chinese restaurant takeout box). One box is enough for a lawn 45 feet by 33 feet, the average city lot in Vancouver. Keep them in your fridge until they’re needed. The start of the 3rd week of July is a good time to apply the solution. Make sure it’s an overcast day or early in the morning, before the sun will cook your worms. Get a big bucket, scooper, watering can and 3 sticks. Water your lawn thoroughly before you apply the nematodes. They can’t move through dry dirt. Fill the bucket with water and then dump in the nematodes. Agitate the water to activate them. Scoop the solution into your watering can. Lay out your 3 sticks so you know the borders of the area you’re watering. Irrigate evenly with the watering can until you’ve covered the area. Move your sticks, refill your watering can and get to the rest of your lawn! Typically, the nematode treatment is reactive, not proactive. Unfortunately, even after you’ve treated your lawn with the nematodes and let them go to work for the season, you’re still left with an unsightly lawn and a damaged root system beneath. Even with the beetles gone, your lawn could take years to get back to looking like something you can be proud of. That’s where Western Turf Farm comes in. We can deliver fresh, healthy grass sod to your Vancouver home so your landscaper can completely replace that brown, torn up turf with a lush new look. 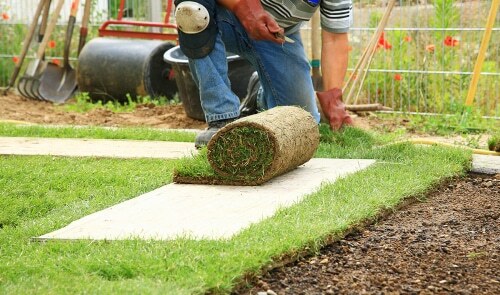 Our partner landscapers in Vancouver will install the grass professionally and in just a few weeks, the grass sod will establish a healthy root system again that can last through the seasons.